Looking for a beautiful, useful crochet basket pattern? I found one I’m absolutely happy with and I wanted to share. It’s the Darling Be Brave Adjustable Basket Pattern by Megan Aldred. I tried several patterns before and my baskets were always either floppy or impractical or ugly. But with this one I’m really in love. The baskets are very sturdy and roomy. Several sizes are possible and explained, the finished object is simple but beautiful and especially the handles are perfect. The pattern itself seems to be a bit expensive at first sight for a basket, but I’m convinced and happy I bought it. You get around 50 pages of pattern, tutorial, tips and tricks and customization possible. Use the right yarn. 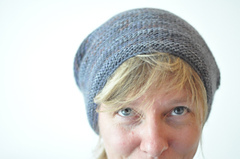 I used the Lion Brand Wool-Ease Thick & Quick Solids recommended in the pattern and it’s the perfect match. The lighter colour is the “wheat” colourway, the darker one the “oatmeal”. Don’t use a yarn that’s too soft or smooth, the basket won’t be sturdy enough to stand upright. Crochet very, very, very tightly. This will surely hurt your fingers, but the outcome is worth the effort. J’aimerais beaucoup m’en faire un aussi…. les tiens sont magnifiques !